The traditionally ‘dead’ period between Christmas and New Year was enlivened by the December 28 sale at Wotton Auction Rooms (17.5% buyer’s premium) in Gloucestershire – to the extent that more than 20,000 people suffering withdrawal symptoms worldwide viewed it online and 1360 of them registered to bid. 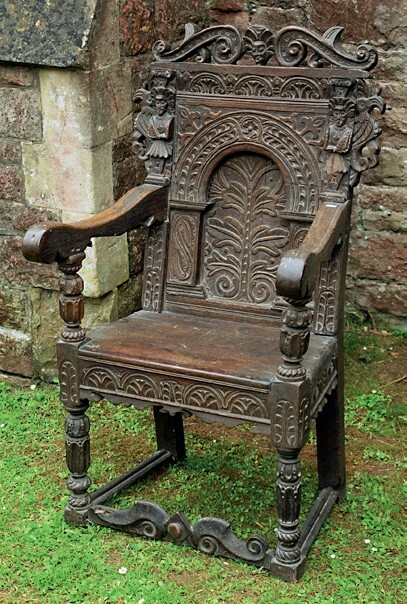 This 17th century oak wainscot chair sold for £6000 at Wotton Auction Rooms. Top-seller was the 17th century oak wainscot chair above. For countless years it had stood in the Parish Church of St John the Baptist in Old Sodbury and it was offered with the written faculty – official permission – from the diocese to sell it. That took a few months but no doubt added to its provenance and, against a £1000-1500 estimate, the chair sold to a specialist early oak dealer at £6000.